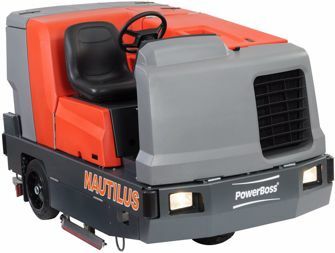 The PowerBoss Nautilus allows for a prolonged run time before draining and refilling, separating it from its scrubber/sweeper competitors. Its stainless steel design suggests for less corrosion and a longer lifespan. The Nautilus features a quick load hopper for safe and easy debris disposal, a quick view squeegee for easy changes and inspection, and an edge scrubber allowing you to clean closely to walls and other various items. A patented hot water system that passively heats the cleaning solution using the heat generated by the engine’s catalytic converter. Virtually maintenance free, TGT eliminates the need to use additional energy to heat the solution, therefore it lowers the cost of energy and shrinks your business’ carbon footprint. Any need for additional detergents to break down dirt will be greatly reduced and, in some cases, not necessary at all. Weight with batteries: 4800 lbs.